Documentation: Specimen: UNSM ZM12309, 23-24 Aug 1968 Sheridan Co (Gates 1969). Fall: There are six documented records. See Comments for additional records probably this species and reported as “Jaeger sp”. 5 Oct 1997 juvenile Lake McConaughy (Dinsmore and Silcock 1998, Brogie 1998). Comments: Since 2000, as observers are better able to document jaeger sightings, there have been two sightings considered likely this species: a jaeger thought to be a Parasitic flew by the observers at Fort Niobrara NWR, Cherry Co 10 Sep 2008; it was accepted by NOURC as “Jaeger sp.” (Brogie 2009). One which was distant but thought to be a dark juvenile Parasitic Jaeger was at Lake McConaughy 19 Sep 2001. See Sharpe et al (2001) for a summary of older records. 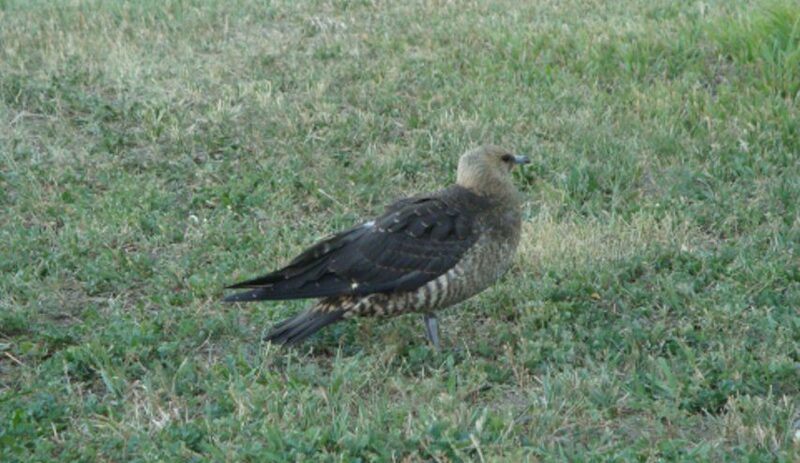 The specimen cited in Documentation was an immature bird found alive 23 Aug 1968 and initially identified as a Skua sp. (Gates 1968). It subsequently died, was collected 24 Aug, and later re-identified as a Parasitic Jaeger by James Tate at USNM (Gates 1969). Photograph (top) of a Parasitic Jaeger in Dawes Co 2 Sep 2013 by Susan Vastine. Dinsmore, S.J., and W.R. Silcock. 1998. Parasitic Jaeger at Lake McConaughy. NBR 66: 114-115. Gates, D. 1968. Skua. NBR 36: 76. Gates, D. 1969. Parasitic Jaeger, rather than Skua. NBR 37:3 1.